Field Target airgun competitors use highly sophisticated scopes to ply their sport. They have to be able to identify the distance to a target smaller than a squirrel’s head out to 55 yards without the aid of a range finder. Then they set-up their scope so that the cross hairs will place the pellet in the center of the bull at that precise distance. Given the rainbow trajectory of some air rifles, that can be a tall order! Greg Shirhall outlined the steps he goes through to maximize his Field Target performance in the article titled Greg’s Guide to Field Target Shooting – Setting Up Your Scope. The process is labor intensive, but that’s what it takes to win. You won’t be able to equal the performance of Greg’s side wheel scope with this entry level Hawke. But you will be able to familiarize yourself with the process of identifying the trajectory of your air gun (ballistics). You’ll begin to understand the importance of determining the distance to the target. And, most important: the process of using your Mil-Dot Reticle to place the pellet in the Bull’s Eye. 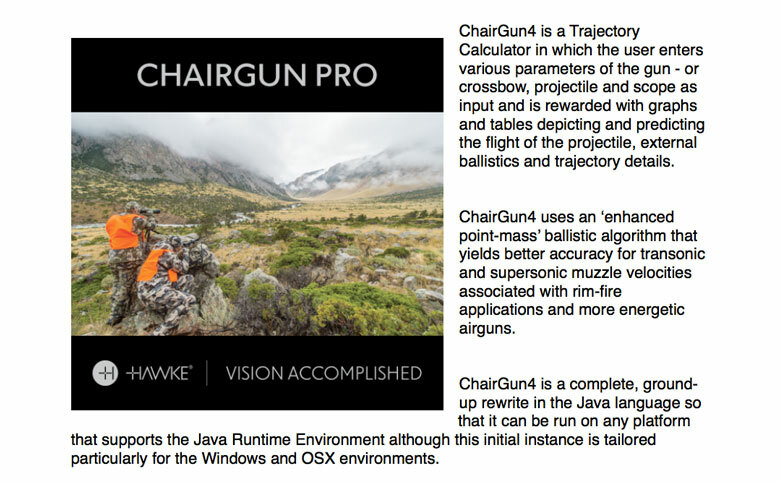 The current version is called ChairgunPro, also referred to as Chairgun4. You can download the Hawke Chairgun program directly from their web site to your desk top, lap top, tablet or smart phone. We downloaded it to my desk top, Lyda’s tablet and Ron Keller’s smart phone. The program presents differently on each device, so you may want to familiarize yourself with the various menus and drop downs. 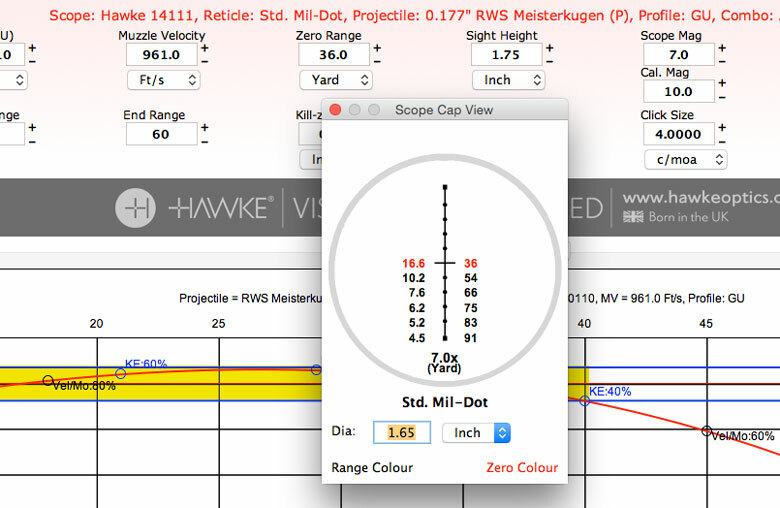 For those who also shoot center fire rifles, Hawke offers their X-ACT Ballistic Reticle Calculator. 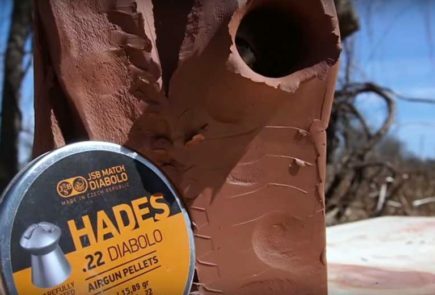 This program also works for air guns, but has the disadvantage of not including a Ballistic Coefficient database for popular pellets. Once you’ve successfully downloaded Chairgun, open HELP topics. They give you a brief introduction to the program and walk you through the use of the program. This is what the Home Screen looks like on a desktop computer. Main settings run across the top and the results are shown as a graph (lower right) and a data table (lower left). The first order of business is “Choosing a Hawke Scope”. 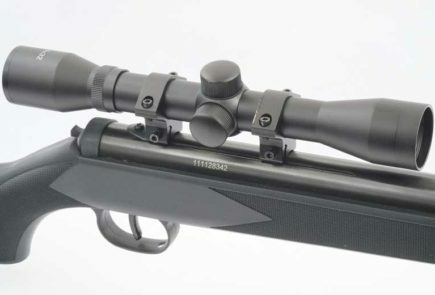 The Hawke scope options are numbered, so if you are using the Vantage, Mil-dot, 2-7×32 scope Logan was using in my review, look for scope number 14111. Click on that Scope and then select “Use this scope”. The next item is “Choose a Reticle”, but you’ve already done that when you chose the 14111 scope, so skip this item. 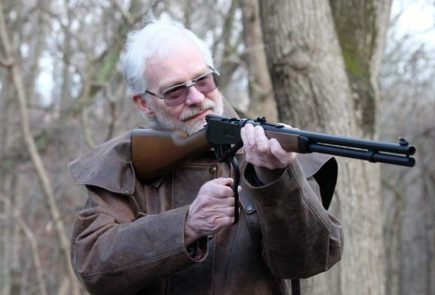 The next Chairgun Menu item involves selecting a Projectile. You most likely will find your favorite pellet listed, and selecting it will automatically insert the B.C. and pellet weight for your calculation. 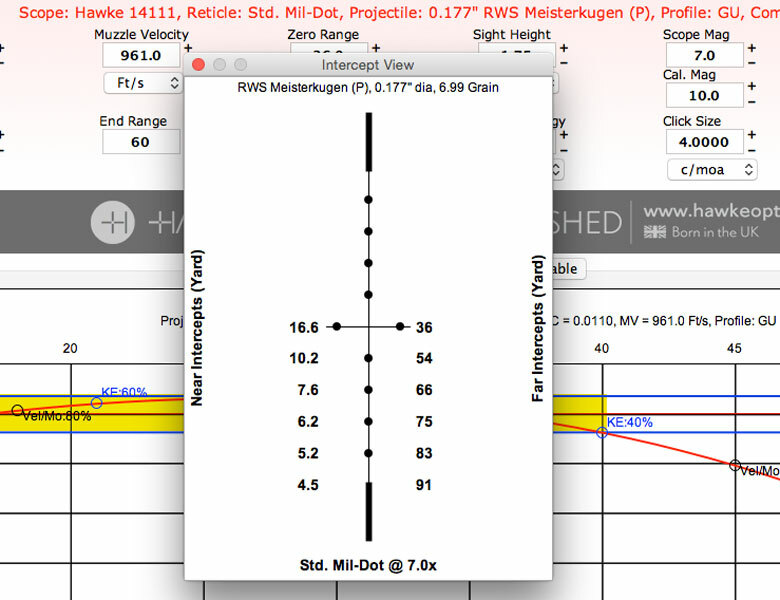 Following that you can begin to fill in the data specific to your ballistic calculation. 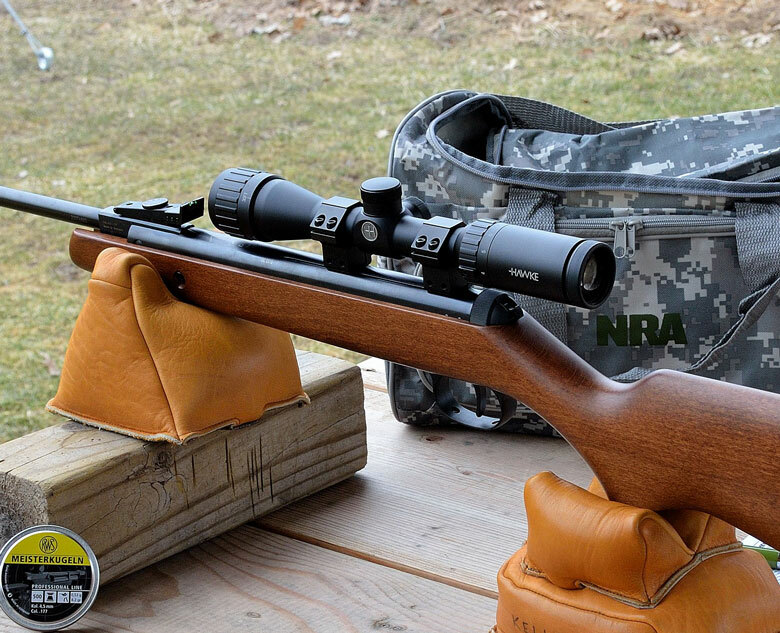 You’ll need the muzzle velocity of that pellet in your rifle (HAM has great data in the Review Center if you don’t yet own a chronograph), sight height above bore, beginning and ending range ( 5 to 55 yds for most people ), Kill-Zone size, scope magnification you intend to use and relevant environmental data. Sight Height above bore. I did an internet search of this item, and discovered that approximating this value is one of the leading causes of calculation errors. It’s important to determine the precise distance between the center of the bore and the sight line AT THE MUZZLE. Easy to do with open sights, but much harder with a scope. The author of this article recommends covering the Objective lens with aluminum foil and piercing the center of the foil with a pin. Then support the gun close to your target backstop and fire a pellet while the cross hair is superimposed on a horizontal line on the target. You can then measure the distance from the line on the target to the pellet hole in the target. It turns out to be 1.1 inches for my Beeman gun and factory scope, and 1.24 inches for my Remington gun and factory scope. Kill Zone. This would seem to be most useful to Field Target Shooters but in fact it is useful to everyone. Position your cursor over the white box just below “Kill Zone”, and right click your mouse. A pop-up box gives you two options. Choose “Fit Zero Range to Current Kill Zone”. As if by magic, Chairgun reconfigures your graph and the “Zero Range” box on your data display to show you EXACTLY what distance you should Zero your gun in order to keep the trajectory of your pellet in your defined kill zone for the maximum distance. This might just be the greatest benefit to using the program. Environment. Here, you can select (or the program will default to) a standard set of weather data, or you can plug in specific values. Elevation above sea level and temperature are the values which will have the greatest impact on your ballistic calculation. Once you’ve configured the ballistic data unique to your gun and pellet, you can save the data to memory and then print out the chart and graph for future reference. 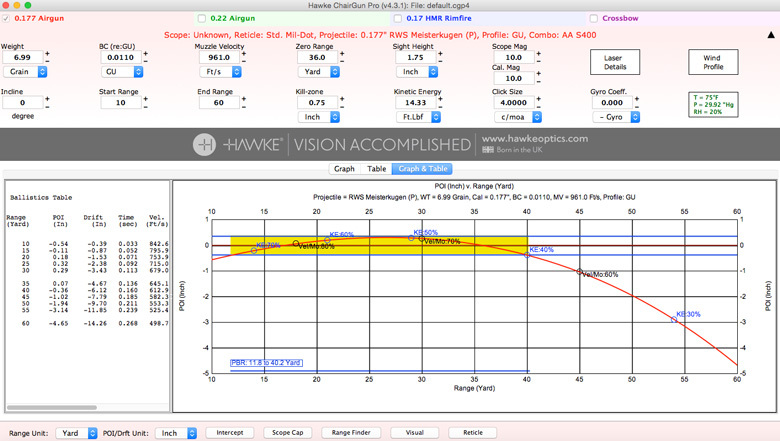 Based on the Hawke scope magnification you are using, and all of the data you have entered relative to the ballistics of the gun and pellet, the program will print out an “Intercepts” chart which you can carry with you on the range or in the field. You can print one for each scope magnification you intend to use, along with complementary scope cap charts so you’ll always have the reference handy. The Intercept printout tells you the the precise Mil dot to use as an aim point for ten distinct distance from the gun (5 closer and 5 more distant than the zero range). That’s why you bought that Hawke Scope! And if your shot is elevated (or down hill), you can use your smart phone or tablet to determine the exact angle of the shot, and the program will include that value in the calculation. Chairgun offers Universal Rangefinder (RF) capability if you know the dimensions of your target, but you can now explore that on your own. Or, you can mark precise distances on the body of your scope where the AO ring (parallax adjustment) focuses at high power. My sample scope accurately displayed the focus distance at 5 and 10 yards, but registered about 60 feet when focused at 25 yards. 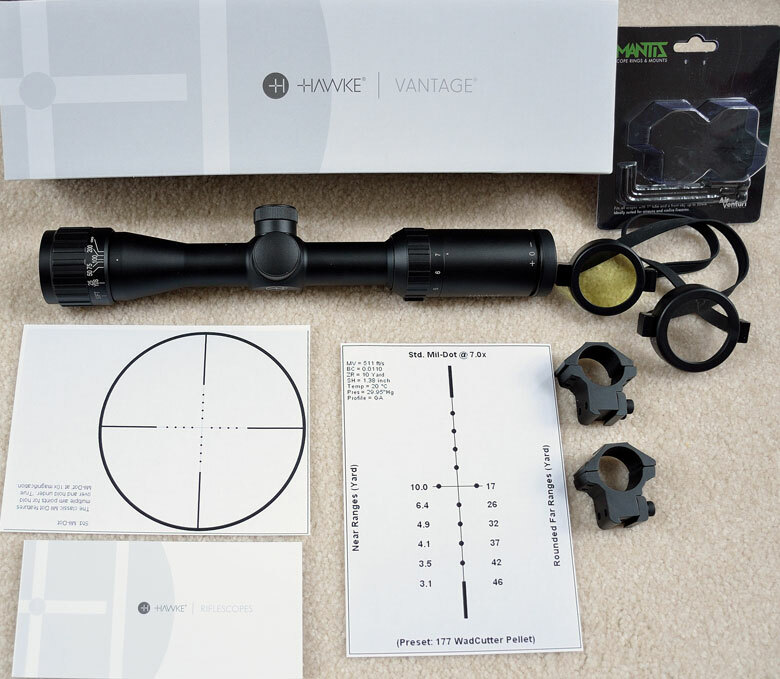 The rangefinder capability of your entry level Hawke won’t be as accurate as the scope system Greg Shirhall is using, but it will prepare you for your Hawke scope upgrade some time in the future.